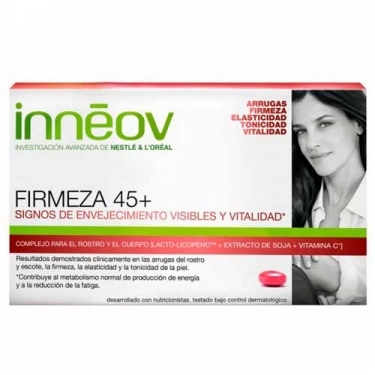 Innéov Anti-Aging Firmness is a nutritional supplement specially formulated for women over the age of 40 concerned with a loss in their skin's firmness. This treatment helps fight skin againg and improve cutaneous density from deep within the dermis. Lycopen, present in tomatoes, is a powerful compound with exceptional antioxidant properties to guard skin and boost cell activity. However when taking lycopen its incredible properties does not reach skin instantly, it must be bio-assimilated to work effectively in the underlying cell layers. This is why researchers at Nestlé and L' Oreal have combined their knowledge and produced Lacto-LycopeneTM. A patented compound with high bioavailability that crosses the intestinal barrier to better reach the deeper layers of the skin. Lacto-LycopeneTM helps shield skin against oxidant damage and stress. Innéov Anti-Aging Firmness ingredients are bio-assimilable rapidly goes to blood flow to reach faster the deep layer of dermis for exceptional results and firming benefits. Take 2 pills a day during a meal during at least 3 months. Can and should be used with a firming cream to hydrate and comfort the surface of skin. Do not exceed the recommended dose. Keep away from children. Not recommended for use by pregnant women. Keep in a cool, dry place.